Explanation: Climb up to 5000 meters (16,500 feet) above sea level, near Cerro Chajnantor in the northern Chilean Andes, and your night sky could encompass this cosmic vista. Recorded from that high and dry locale, the spectacular fish-eye image features the myriad stars and sprawling dust clouds of our Milky Way Galaxy. 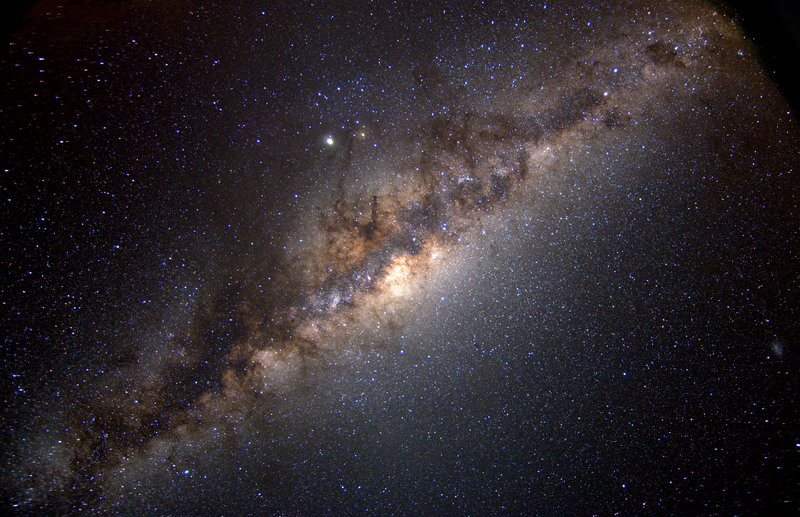 The direction toward the center of the Galaxy is near the zenith and center of the picture, but the Galactic Center itself is hidden from view, located far behind the obscuring dust. Brilliant Jupiter rules this scene just above the Milky Way's central bulge with the noticeably fainter, yellowish, giant star Antares to its right. Small and faint, near the right edge of the picture is one of the Milky Way's many satellite galaxies, the Small Magellanic Cloud.